Thursday’s Podcast Guest: Clara Parkes! The book was born from a simple notion: We are what we knit. I’m not suggesting you’re a pullover or a pair of socks. But over the years I’ve realized just how deeply knitting itself—our stitches, materials, techniques—is a metaphor for who we are and the lives we live. It began while I was sitting at a table for two, waiting for a friend to show up and suspecting that I’d been stood up yet again. I wondered: Is this how a dropped stitch feels? Or consider the traveling stitch, that blundering Winnebago swerving from lane to lane without so much as a how-do-you-do. Or garter stitch, the robust and wholesome friend who’s always overlooked in favor of the slender homecoming queen, stockinette? The stories became more personal as my mind turned to my grandma, terribly self-conscious of the skintags that peppered her neck yet obsessed with adding bobbles to everything she knit. Or my parents’ divorce, a poorly worked steek that caused my young self to unravel. The Yarn Whisperer is about my own life in knitting, both literally and figuratively. But it also explores our collectivelives in knitting. I’ve left many blanks for you to fill in. My hope is that it may help you see your own story, and your knitting, in a new, more meaningful light. If you’ve listened you heard Clara’s wonderful chapter on bobbles, and is it just me, or who else wants to see her book turned into an audiobook?? *Giveaway* – leave a comment here with Clara’s keyword, and be entered to win a copy of her super awesome fun book!! I love how Clara knows her yarns and fibers. She teaches us about crimp, staple length, and other fascinating properties. What a show! I really enjoyed listening to Clara, and look forward to reading her book. When I was a child of the 80s, I used to crimp my hair everyday. Now I’m glad the only crimp in my life is on fiber, not me! This was the first time I got to listen live. I so very much enjoy all of Marley’s shows, but it was even more fun watching chat room chatter at the same time. I would LOVE to buy Clara’s new book, but all the money my kids are spending in college is putting a crimp in my spending budget! I sure hope I can win a book instead! I am so crimped that I get a chance to win this book! I love Claire and her Knitter’s Review. I would love to get a copy of her book, I know it won’t crimp my style. The crimp in the yarn is a much better term than the kink or kinkiness of the yarn. Unfortunately, the kink is usually what comes to mind first. I love a nice crimp in my fiber, but I definitely do not like a crimp in my hair. Too many 80’s flashbacks! Thank you for a wonderful show, Marley and Clara! My dog’s hair looks like I crimped it when it gets wet. Especially around his ears. I won’t be knitting with it though. I raised lambs for 4H and I loved seeing the crimp in their wool. I love crimpy yarn and catching up on all of your podcasts! I cleaned up my craft room while listening to 2 episodes. You are so full of yarn love! i’ll crimp my hair if I don’t win this book!! I can’t wait until I go to Rhinebeck and see sheep in person so I can observe the natural crimp of wool. I really enjoyed Clara’s spirit and the reading she did from the book. You two are lucky that you have such a treasured friendship, the kind where you feel safe enough to let your guard down so much that every cell in your body relaxes, right down to the crimp in your hair. I saw a whole new side of Clara in this interview. Previously, I’d only seen her on Knitting Daily where she seems very serious and scientific about yarns and their crimps. I loved this and can’t wait to read her book! I would be one of those to get the audiobook too. Clara will not put a crimp in your knitting style. She’s my yarn guru of choice! 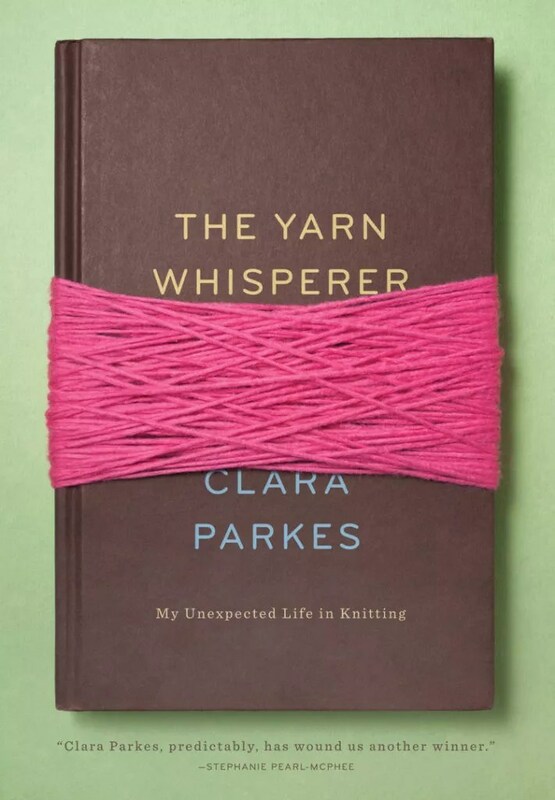 Loved the interview, and especially Clara reading a passage from The Yarn Whisperer. I met her this past MDSW festival and my friend and I gushed over all we have learned about wool, crimp, plies, etc to make better yarn and better match our yarn to our projects. Great interview. I love yarn and fiber that has a lot of crimp. Love the podcast and the use of ‘crimp’ to describe yarn! I loved the interview with Clara Parkes. She’s a hoot. If a lock of fleece has a good crimp to it, your sure to get a nice spun yarn. I am looking forward to reading her new book. Your interview with Clara Parkes was great! I’ve read her Knitters Book of Wool where the word crimp is very important. Her Knitters Book of Yarn is on my Christmas list and The Yarn Whisperer would make a great addition to my books. I hope The Yarn Whisperer is available on the Nook Color. It’s usually cheaper that way and doesn’t put such a crimp in my spending. Although I would much rather have this book in hand. Speaking of Crimp- an old SNL episode was on the other day with Christina Aguilara who had crimped hair! Remember when that trend was around in the 90s?? I loved hearing Clara read from her new book. She has such a pretty voice. I’m definitely going to read her previous books, and learn more about different yarns and their crimp. I love everything about Clara Parkes and her fabulous books. I would love a copy of the Yarn Whisperer to complete my collection! But if I don’t win, I will soothe myself stroking some lovely, crimpy locks of BFL. I just love Clara’s books, they don’t crimp my style at all! She is a delight, I can see why Marly loves her so! Last Thursday my best friend and I went to the Mountain Meadow wool mill in Buffalo, Wyoming and took the tour. It was so interesting to see the different kinds of wool and learn about their different properties including crimp. I bought a hank of worsted weight Suffolk wool to swatch. It is truly lovely and will make a great rustic sweater with lots of texture. I loved the interview with Clara Parkes and always look forward to the Knitters Review. The crimp in my wool is the only crimp in my life… Thanks Clara for sharing your knowledge & your experiences!! I am learning to appreciate crimp in wool as a new spinner. Thank you for the wonderful interview with Clara Parkes! Thanks for another interesting interview – I loved the bobble story! But now I’m afraid I’ll think of “kink” when I mean crimp! Keep up the good work! Loved this interview-love Clara Parkes! Love yarn with crimp! Yarn with crimp is much more fun to knit with than flat! Remember when people used to use those curling irons that put crimp in your hair? I guess I’m a child of the 80’s-anyhow, these days I enjoy studying fiber crimp. Sounds like Clara’s new book will be fascinating. Crimp! Kink! What’s the difference…… Would love to win those books. Winning these books would NOT crimp my style. I would gift them to my mom who loves to read and taught me how to knit. Hi, I just had the time to hear your wonderful interview with the fabulous Diana Gabaldon. I wish I was a “sassenach” but I’m just a regular gal from Chicago who is a huge fan. Thanks for the wonderful books and interview. Why this is crimply wonderful!